The tiny yellowish to orange cap with a central depression, the gills running down the stem, the white spore print, and the growth pattern (in dense clusters on decaying conifer wood) distinguish Xeromphalina campanella. It is nearly impossible to separate from Xeromphalina kauffmanii, which grows in clusters on decaying hardwood logs—so, unless you are sure of the log's identity (conifer-hardwood-wise), you will need to measure spores to be sure which species you have found; the spores of Xeromphalina campanella are wider and more ellipsoid. 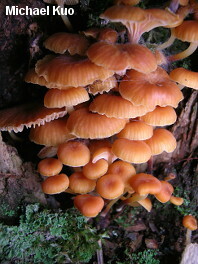 Ecology: Saprobic on the deadwood of conifers; typically growing in dense clusters on stumps and logs, but occasionally growing alone or gregariously; found nearly year-round, especially in warmer climates, but most common in summer and fall; apparently widely distributed in North America. The illustrated and described collections are from Michigan, Colorado, and Texas. Cap: 5–20 mm across; convex, becoming broadly convex with a central depression and an arched margin; bald; dry; widely lined on the margin when wet; brownish yellow, rusty, yellowish, or orange; usually darker towards the center; fading. Gills: Running down the stem; fairly distant; usually with many cross-veins; pale yellow or orangish; short-gills present near the cap margin. 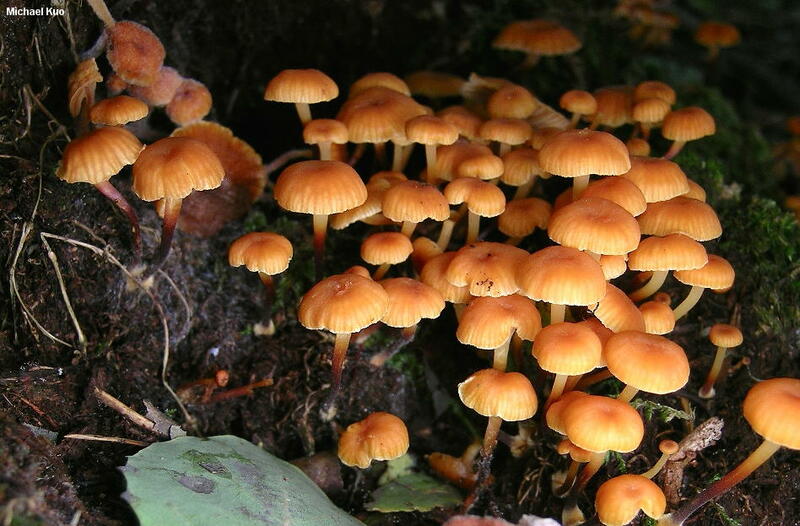 Stem: 1.5–3 cm long; 1–2 mm thick; more or less equal; yellowish above, darker below; bald above, finely hairy at the base with orange to yellow basal mycelium; rather wiry and tough; often curved. 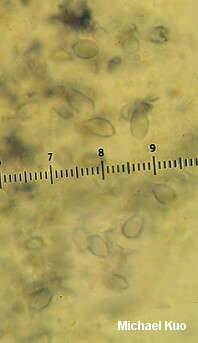 Microscopic Features: Spores 5.5–7 x 3–4.5 µm; smooth; ellipsoid; weakly to moderately amyloid. Pleuro- and cheilocystidia fusiform; up to about 55 x 15 µm. Caulocystidia clavate to fusiform; up to 75 x 15 µm; thin-walled; hyaline in KOH. Clamp connections present. REFERENCES: (Batsch, 1783) Kühner & Maire, 1934. (Fries, 1821; Saccardo, 1887; Smith, 1949; Miller, 1968; Smith, Smith & Weber, 1979; Arora, 1986; States, 1990; Phillips, 1991/2005; Lincoff, 1992; Metzler & Metzler, 1992; Barron, 1999; Roody, 2003; McNeil, 2006; Miller & Miller, 2006; Trudell & Ammirati, 2009; Kuo & Methven, 2014.) Herb. Kuo 05130301, 08120303, 10200702.